Dr. Hahn, MD, MS leads the statewide network, providing research and educational opportunities for primary care physicians and other healthcare providers. Dr. Hahn was one of the founding members of WREN and was named Director on November 1, 2012. Dr. Hahn is the author of A Cure for Asthma? What Your Doctor Isn’t Telling You – And Why. 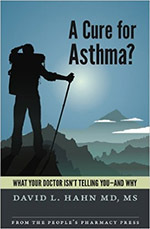 This book challenges conventional wisdom about the causes and treatments of asthma. Dr. Hahn is a graduate of Stanford University School of Medicine, and completed his Family Medicine Residency at the University of Iowa Hospitals and Clinics. He received his Master of Science degree in Preventive Medicine & Epidemiology from the University of Wisconsin-Madison. Dr. Hahn is very well known to members of the WREN Community. He was one of the founding members of WREN, and is a past member of the Steering Committee. Dr. Hahn’s primary areas of research interest are asthma and the delivery of clinical preventive services, and he has a proven track record for obtaining grant funding, conducting clinical trials within practices, and his research productivity has resulted in 33 peer-reviewed publications. Mary Henningfield joined the WREN team in 2018. Prior to joining WREN, Mary served as the Director of Scientific Education and Research at Free to Breathe, a national lung cancer advocacy organization. At Free to Breathe, she provided oversight to the development and execution of patient education, outreach, and advocacy programs. She also managed their research grant program, which awarded funding for young investigators, studies of lung cancer metastasis, and innovations to facilitate patient enrollment in clinical trials. Mary has held positions at Abbott Laboratories, Covance, Inc., Inventiv Health, and other medical communications companies. As a Clinical Research Scientist for Abbott Laboratories, Dr. Henningfield designed and executed research plans to study the effects of nutrients on the immune system. She is the inventor of a patented enteral nutrition formula for patients with traumatic injury. As the scientific lead for pharmaceutical product launches, she wrote publications covering a variety of indications, including oncology, neurology, virology, and nephrology. Dr. Henningfield has developed numerous disease awareness and education campaigns for patients, caregivers, and healthcare professionals. Mary earned MS and PhD degrees in Nutritional Sciences from the University of Wisconsin–Madison, where she investigated the uncoupling protein of brown adipose tissue. She then held a post-doctorate position in the Hematology Department at Temple University. Her interests include health literacy, development of patient and physician education materials, shared-decision making in clinical practice, and health care disparities. Lisa Sampson started as the Department of Family Medicine & Community Health (DFMCH) Research Program Manager in 2018. In her role, she provides administrative leadership to the DFMCH research enterprise and the Wisconsin Research and Education Network (WREN). She provides administrative research and grant management support. In addition, she also provides oversight and leadership to assure greater integration among DFMCH research programs. Lisa received a Master’s in Business Administration from Cardinal Stritch University in 2012. Previously, Lisa worked in laboratory, clinical and translational research for over 17 years in the UW Department of Radiology. In her free time, Lisa enjoys spending time with her husband and two daughters. She enjoys showing horses, spending time outdoors, and coaching basketball. WREN Research Coordinators, operationalize, and implement quantitative, qualitative, and mixed-method research projects at WREN clinics throughout the state. In addition to research coordination, our Coordinators are certified Practice Facilitators able to engage with primary care clinics to evaluate and improve their quality of care. Due to the statewide distribution of WREN practices and WREN associates, Coordinators travel throughout the state. Amanda joined the WREN team in 2014. She holds a Master of Public Health degree with a concentration in Community Health Sciences from the University of Illinois-Chicago and a Bachelor of Science degree in Biological Sciences from Marquette University in Milwaukee, WI. Prior to her role with WREN, Amanda worked with the Institute for Health Research and Policy in Chicago, IL on a multi-year health initiative. The study funded several different evidence and practice-based approaches to increase opportunity and remove barriers to healthy living. She also worked with the Wisconsin Pregnancy Risk Assessment Monitoring System (PRAMS) in Madison, WI, which is an ongoing survey of new mothers conducted jointly by the Centers for Disease Control and Prevention and state health departments. PRAMS collects state-specific, population-based data on maternal attitudes and experiences before, during, and shortly after pregnancy. Some of Amanda’s research interests include: community health, community capacity building and community engagement, public health policy and advocacy, maternal and child health, and programming that targets the prevention of obesity and the promotion of good nutrition and physical activity. In her free time, she enjoys traveling to new places, running outdoors, and attempting to cook new dishes. Deanne comes to WREN with extensive experience as the Program Director for Wisconsin Strengthening Treatment Access and Retention-Quality Improvement (STAR QI) Program. This is a 10 year collaborative program between the University of Wisconsin-Madison Department of Family Medicine and Community Health, and the State of Wisconsin Department of Health Services. In addition to providing Quality Improvement Coaching to Behavioral Health Agencies, Deanne is a Process Improvement Coach for the Network for Addiction Treatment (NIATx) program. While continuing in these roles, Deanne has joined the WREN team to assist with quality improvement, project leading, and coordination activities. Prior to Behavioral Health QI Coaching, Deanne provided clinical services to a diverse client-base through various for-profit and not-for-profit delivery systems. Most recently, that client population included a stress reduction program for Wisconsin State Patrol Personnel. Deanne’s diverse background and experience includes Employee Assistance Programming, Project Management, Case Management, and Utilization Review. Deanne has a Master of Science degree in Clinical Psychology from the University of Wisconsin-Oshkosh and a Bachelor of Science Degree from Iowa State University. Alice joined the WREN team in 2016. Prior to her role with WREN, she worked for Free to Breathe, a national lung cancer patient advocacy foundation. In her role as Free to Breathe’s program manager, Alice was responsible for strategic planning, oversight and implementation of the organization’s research, outreach, educational and advocacy programs. She planned and implemented a wide range of programs to further the organization’s mission including conferences, research grants, patient education resources and community engagement initiatives. She coordinated the organization’s national continuing medical education conferences, which brought together medical professionals each year to learn about developments in the lung cancer field. She also developed and managed a national training workshop for grassroots advocates to learn strategies for community advocacy. Through her work in healthcare advocacy, Alice developed interest in patient and stakeholder engagement in the research process. Prior to working at Free to Breathe, she worked at the University of Wisconsin-Madison as a research assistant and associate in the field of biological sciences. Alice holds a PhD in Molecular and Environmental Toxicology from the University of Wisconsin-Madison and a Bachelors of Arts in Biology from Albion College. In her free time, Alice loves to cook, hike and camp. She is also an active volunteer with the Boy Scouts, her church and neighborhood association. Cassandra joined the WREN team in 2017. She holds a Master of Science in Global Health degree from the University of Notre Dame and a Bachelor of Science degree in Biology from the University of Minnesota, Twin Cities. During her Capstone Research project at the University of Notre Dame, Cassandra investigated the use of STELLA software for mathematical modeling of type 2 diabetes progression in Chennai, India. The research project involved a systems thinking approach, intended to project the future burden of diabetes and targeted interventions to reduce both incidence and prevalence of type 2 diabetes and related health conditions for child and adult populations in Chennai, and in South India as a whole. Some of Cassandra’s research interests include: Chronic diseases in resource poor settings, community health, community engagement and patient-driven research, and interdisciplinary projects that aim to connect and engage community members with health and scientific research specific to their environment. Lindsey joined the WREN team in 2017. She holds a Master of Science degree in Rehabilitation Psychology from the University of Wisconsin – Madison and a Bachelor of Arts degree in Psychology and Women’s Studies from the University of Wisconsin – Eau Claire. Additionally, she is a licensed Certified Rehabilitation Counselor (CRC) in the state of Wisconsin. Prior to her role with WREN, Lindsey worked as an Outreach Specialist in the Department of Family Medicine and Community Health. She maintains a Co-Investigator role for the Juvenile Justice AODA Program, a community effort to create and increase screening, intervention and treatment of juvenile alcohol and drug problems for Wisconsin’s at-risk youth population. She previously worked with the FASD Education and Outreach Projects team on projects including Booshké giin, a prevention program to reduce alcohol-related harms including the risk of alcohol-exposed pregnancy, and the Wisconsin FASD Treatment Outreach Project, a program to provide training and outreach on fetal alcohol spectrum disorders in Wisconsin. Some of Lindsey’s academic interests include reproductive health, maternal and infant health, mental health and substance use disorders, fetal alcohol spectrum disorders, holistic and integrative care, inequity and social justice concerns, and canine and equine therapies. Dominic joined WREN in 2017. He earned his Master of Public Health degree from the University of Minnesota-Twin Cities after completing his Bachelor’s of Arts in Molecular Biology at the University of Wisconsin-Madison, minoring in Global Health. Before joining WREN, Dominic served as a research specialist at the McArdle Laboratory for Cancer Research in Madison, studying small molecule compounds that modulate estrogen receptor’s role in breast cancer development and progression. Prior to his role at McArdle, Dominic supported the evaluation of the Minnesota Statewide Health Improvement Partnership (SHIP), a policy, systems, and environment change program through the Minnesota Department of Health. His capstone project was an evaluation of SHIP child care provider trainings. Dominic’s research interests include: Maternal and child health, health communication, and the interface between public health and primary care practice. In his free time Dominic enjoys a relaxing cup of tea or coffee accompanied with insightful conversation, reading thought provoking books, watching movies, and playing board games. Alyssa joined the WREN team in 2018. She holds a Bachelor of Science in Kinesiology from the University of Wisconsin-Madison. Prior to her role with WREN, Alyssa worked in laboratory, clinical and translational research throughout her undergraduate years in the UW Department of Radiology and UW Department of Surgery. During her Senior Practicum, she worked as a Clinical Exercise Physiologist Intern in Cardiac Rehabilitation at UnityPoint Health-Meriter, where she focused on patient education, disease management and exercise physiology. Some of Alyssa’s academic interests include exercise as a mode of treatment, mental health and substance use disorders and cancer research. Outside of work, Alyssa enjoys riding and showing horses, waterskiing and snowmobiling. In her role as the University Services Program Associate, Denise is responsible for providing complex administrative support to the program, ensuring that all staff members have the resources they need to keep things running smoothly. Denise has a broad based experience having provided administrative, accounting, and management support to various private sector industries throughout her career.